Flying while pregnant can be risky according to doctors. Flying to an exotic location without the necessary inoculations can also be risky. So if you’re a pregnant lemur due to jet off to the British Virgin Islands and haven’t had your jabs, don’t bother packing, you’re not going anywhere. Sir Richard Branson’s plans to import 30 lemurs from different zoos around the world, to the island of Moskito (which he owns) have been put on hold because a few of the females are expecting. The billionaire is hoping to create a lemur colony on the island as part of a broader plan to save animal species around the world from extinction. Michael Montrose, chief veterinarian of the British Virgin Islands, told the news agency Associated Press: “The females can’t travel unless they get the required yellow fever vaccine, which they can’t receive until after they give birth. You don’t have to be a primatologist to work that one out. Branson and the government of the British Virgin Islands have been criticised by conservationists around the world, for not considering more carefully the immediate and long-term impact of introducing a non native species into a completely different ecosystem. One lemur conservation expert believes it’s a bad idea. Professor of Biology and Evolutionary Anthropology as well as the director of the Duke Lemur Centre Dr Anne Yoder said: “Sir Richard Branson’s proposal to translocate several species of lemur, beginning with the ring-tailed lemur, to a private island in the British Virgin Islands, though well-intentioned, is alarmingly misguided. Earlier this year, Branson received a provisional permit to import 15 male and nine female lemurs from zoos in Canada, Sweden and South Africa. 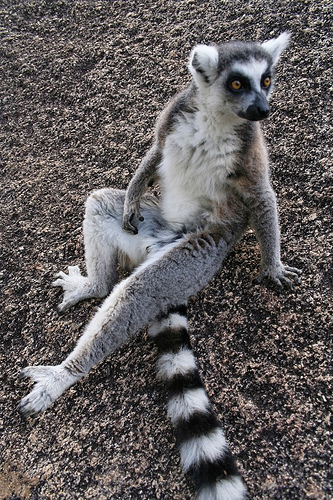 Lemurs are indigenous to Madagascar and the Comoro Islands. Their numbers are threatened due to the increasing loss of habitat from deforestation and illegal logging. The British Virgin Islands veterinary division has said it will not issue final permission until the lemurs have been declared free of diseases including yellow fever and herpes, which can be transmitted to humans through bites. Mr Montrose added that he didn’t know how many of the nine female lemurs are pregnant. or how long it would take until all the primates are vaccinated. Is this divine intervention, who knows? But maybe this pregnant pause, (yes the pun was intended!) is just the time Branson needs to weigh up all the pros and cons of his well-meaning proposal.